This project is intended to help you get familiar with the QCA4020 System-On-Chip (SoC) Product Development kit. The QCA4020 IoT solution offers Wi-Fi, Bluetooth low energy (BLE), and 802.15.4 capable radios in a single-chip package. The project uses the “Onboard” sample demo included in the SDK with the Eclipse IDE to get started. The objective of this project is to get familiar with the QCA4020 development kit. The onboard demo application included in the SDK provides a mechanism to demonstrate end-to-end communication between the QCA402x development boards and the mobile app through cloud network or wireless technology. The desired outcome for this project is to use the onboard demo application in “Without Cloud” mode to directly read/write sensor data from the development kit using the BLE and Zigbee connections. For the time being, you can set the kit aside while you install the software components and set up the development environment on your computer. During the setup process, you will only briefly use the kit while installing the FTDI drivers for JTAG. Some of the support scripts are Python-based so be sure to install Python 2.7.X because the support scripts do not support Python 3. After installation, add the path to python. Install Java: Eclipse IDE has dependency on Java, JDK 8 or higher. After installation, add path to Java. Install OpenOCD version 0.10.0 [2017-06-09] which is available here. 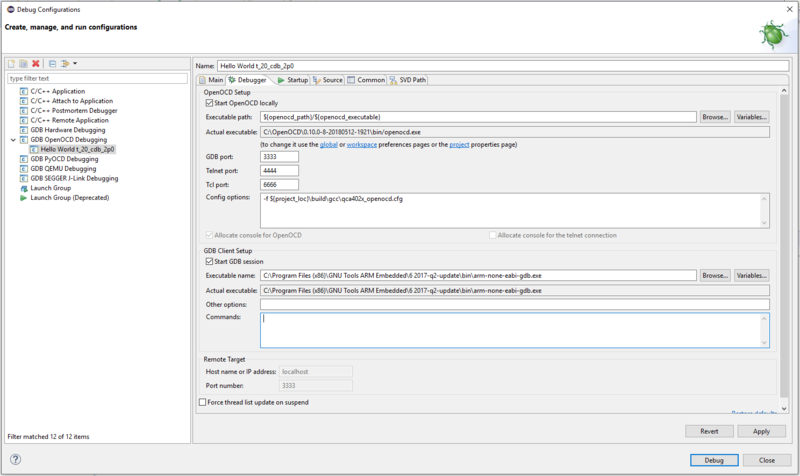 OpenOCD plugin is required to establish the connection between Eclipse IDE and onboard FTDI JTAG debugger. After installation, add the path to OpenOCD. Download GNU Arm Embedded toolchain version 6.x (gcc-arm-none-eabi-6-2017-q2-update). Install by running the ".exe" file and make sure you select the option to "Add path to environment variables" during the final step. In the Available Software window, click "Add" and enter the Name and Location of the repository. Location: "http://gnu-mcu-eclipse.netlify.com/v4-neonupdates" Enter details and click "OK" as seen below. Select "GNU ARM & RISC-V C/C++ Cross Development Tools" and click "Next" as seen below. You will see the list of Items to be installed as seen below. Follow the on-screen instructions and select "Finish" to complete the installation. 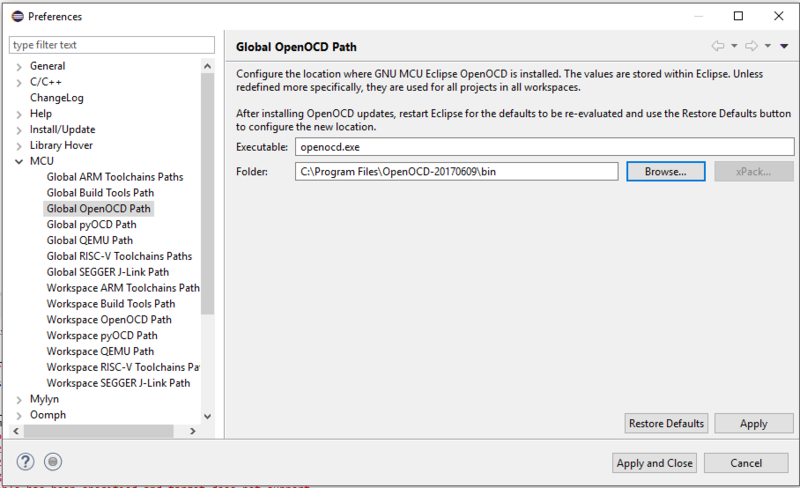 Restart the Eclipse IDE and under Window > preferences set path to openOCD as seen below. 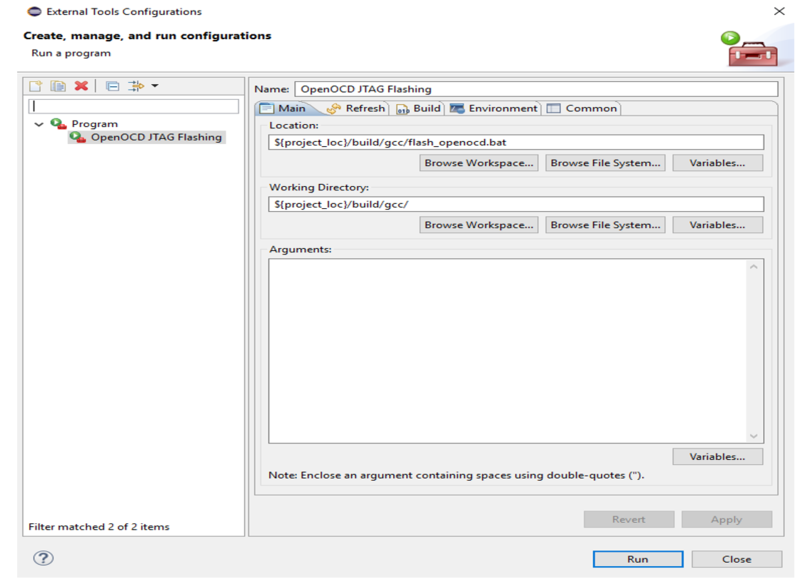 Run >Debug Configurations > GDB OpenOCD Debugging Set the Application and OpenOCD options as show in the images below. Select Quartz.elf as the C/C++ application. If you have already built the image, select Disable auto build. 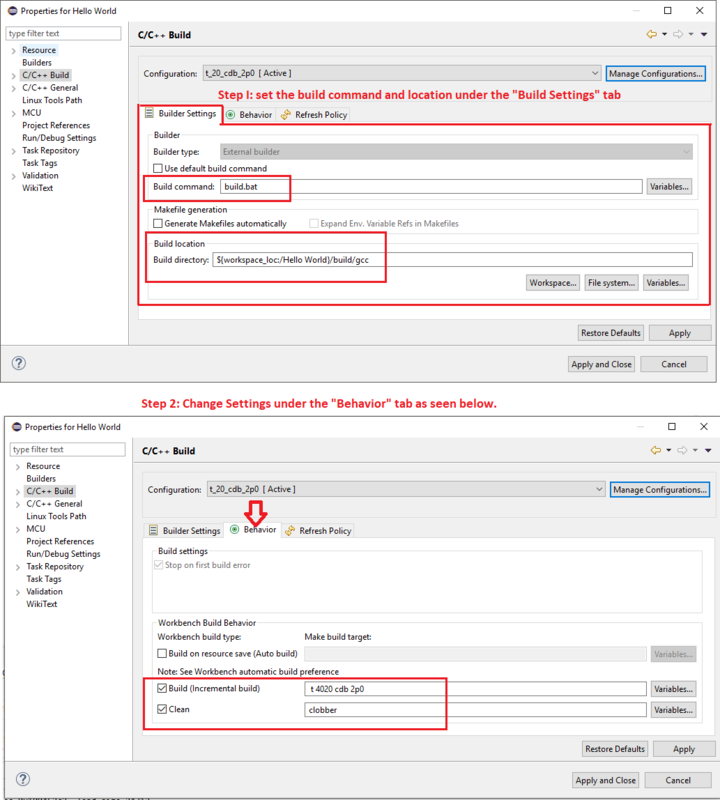 If image is not built, select Use workspace settings. Provide the arm-none-eabi-dgb executable path for the GDB client as seen below. 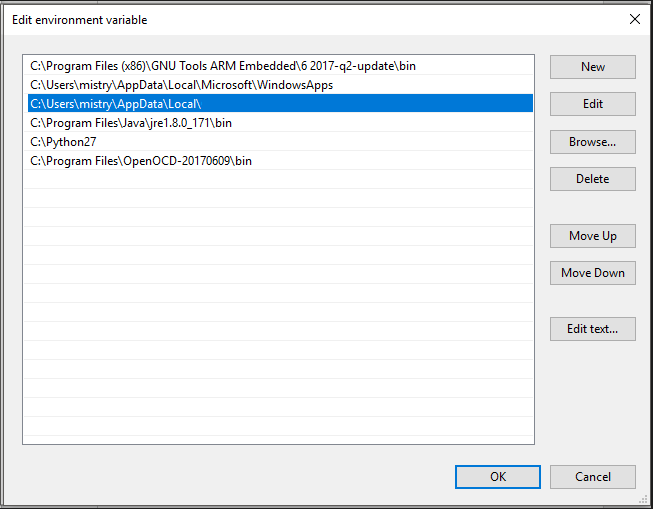 Download "QCA4020 OEM SDK+CDB" which is available under the Qualcomm Developer Network software section here. Copy the jar file (QCA402x_plugin.jar) to the "dropin" folder under the Eclipse IDE installed folder. Restart the Eclipse IDE if running. To restart Eclipse, click on the File menu of Eclipse IDE and select the Restart menu item after the plug-in is installed. Download the zadig application from http://zadig.akeo.ie/. Connect the J85 connector on the development board to the host PC using the included Micro-USB cable. 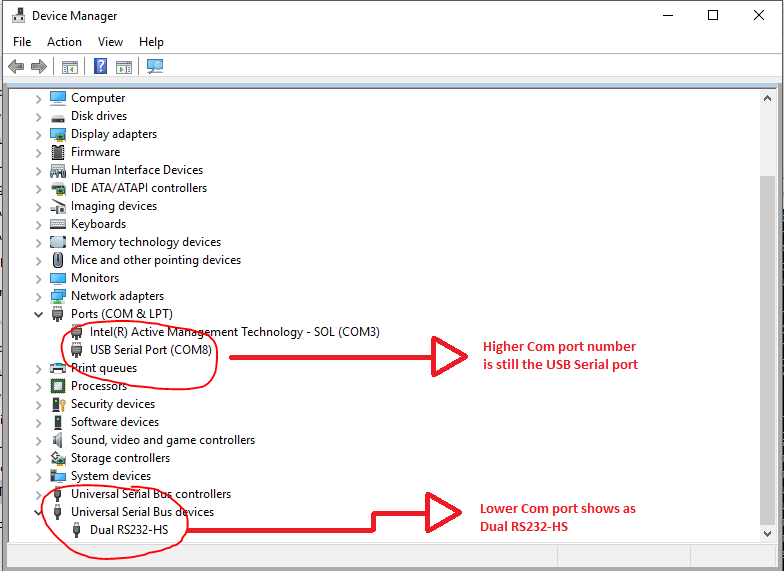 Once the QCA4020 Development board is connected to the host PC, the Device Manager shows two COM ports. 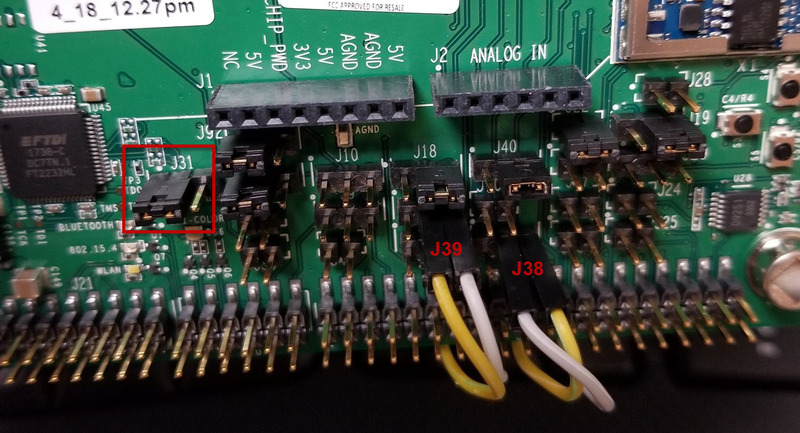 The lower port number is for JTAG and the upper port number is for serial connection. Run zadig.exe file and go to Options > List All devices and select the device in the drop down. Dual RS232-HS (interface 0) represents lower port number and dual RS232-HS (interface 1) represents higher port number. The following example shows Select Dual RS232-HS (interface 0) to install FTDI on the WinUSB driver for JTAG interface. After installing the FTDI driver, the Device Manager will look as seen below. You will need this library to parse the sensor data received from the router/coordinator. Download jsmn library from https://github.com/zserge/jsmn and extract it. Create thirdparty/jsmn/src folder under the target folder. Copy the "jsmn.c" file from extracted "jsmn-master" to the thirdparty/jsmn/src folder. Make sure that the paths are set correctly under the environment variables. They should be set as seen below. 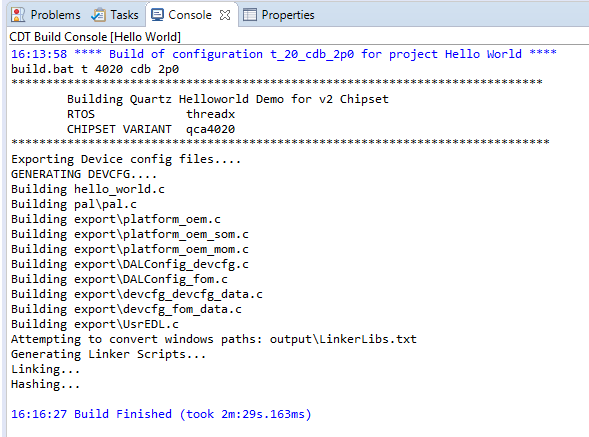 Congratulations, you have now successfully set up the development environment for the QCA4020 development kit. The next section shows you how to import the sample "Onboard_demo" application. 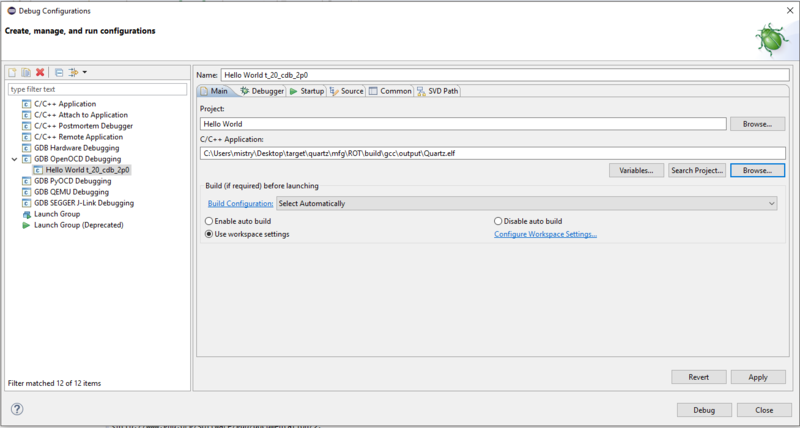 Install Eclipse project files for sample demo applications. Run the sh eclipseSupport.sh or eclipseSupport.bat command. After executing the script, the Eclipse project files .cproject, .project and .settings folder are updated in the respective folders of the demo applications. Go to File > Open Projects from File System and set import source for the demo application. You should be able to see the import source as an Eclipse project. Right click on the project name in project explorer and go to "Properties". Verify the build command and the build directory in the Builder settings tab. Go to C/C++ build and set the build command to "build.bat", and the build directory to "path to source". 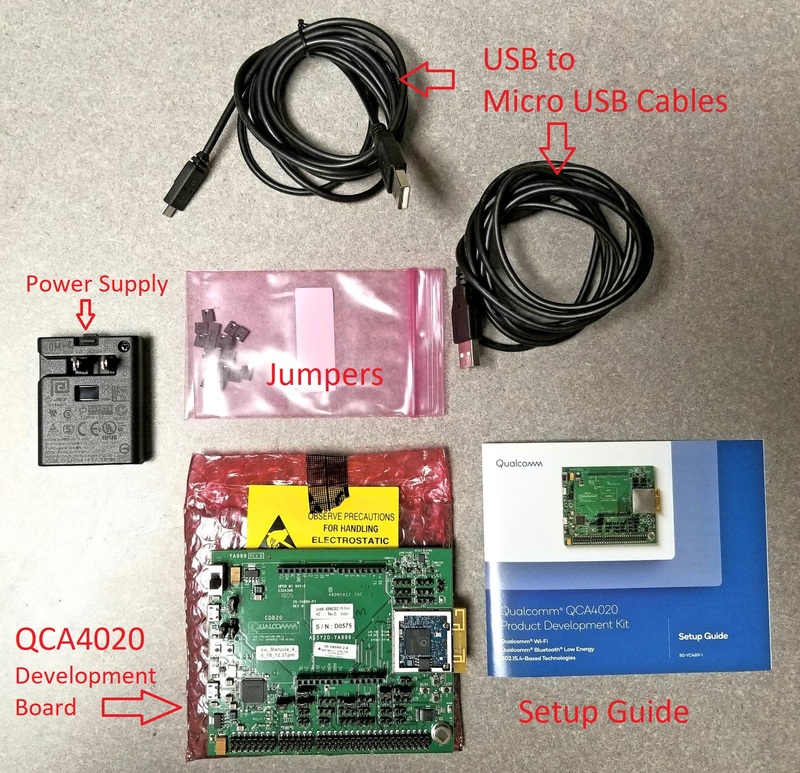 Flash the Application on the QCA4020 development board using JTAG and Eclipse. Alright, time to start playing with the Developer Kit. Since this project/demo involves two QCA402x development boards, flash both the boards by following the below steps. Setup the QCA4020 development board as described in Appendix A, "CDB2x board setup" in QCA402x-CDB2x development kit user’s guide. Put the jumper on J31 1&2 on the QCA4020 development board. Tip: There is a "Dot" next to each header that indicates the position of Pin Number 1. After the flashing through JTAG is done, remove the jumper. Jumpers on the developer board should be as seen below. Click on the program, create a new launch configuration and update the paths as shown below in the Main tab. Provide the path for "flash_openocd.bat" or "flash_openocd.sh" in the location box. To flash the program, click Run > External Tools > OpenOCD JTAG Flashing The flashing logs can be seen on the Eclipse console. SUCCESS: The process "openocd.exe" with PID 17776 has been terminated. The application was flashed successfully on the development board. There are two mobile applications available at the following location within the downloaded SDK: /target/mobileapp/android − QCAOnboard and Sensor application. Copy the application apk files from this folder to your smartphone with Android device version 5.0 or higher and install them. Application scans for available devices; you should provide the credentials required to onboard the kit. Application establishes connection to the board via Wi-Fi or BLE, based on the onboarding mode for which the device is configured. You can use the autoboot mode to run the application on the development board. The Autoboot mode refers to the mode where the system boots up on a power cycle and no JTAG connectivity is required. Follow the below steps to run the application in Autoboot mode on both the development boards. Remove the jumper on J31. This was connected to flash the image on the board. The device starts in BLE peripheral mode and starts advertising. This first step is not required if you are onboarding for the first time. The application has the provision to save list of previously onboarded ZigBee coordinators, so if you have used the application before, it is required to delete the previously onboarded device. Click on the "Settings" icon on top right corner of qca_onboarding mobile application. By selecting the Coordinator List, you will find the list of saved Zigbee Coordinator devices. Click on the "Delete" icon and choose "YES" to remove the device from saved list of Zigbee Coordinators. On your smartphone, launch the "QCA OnBoarding" application that was installed during the setup. 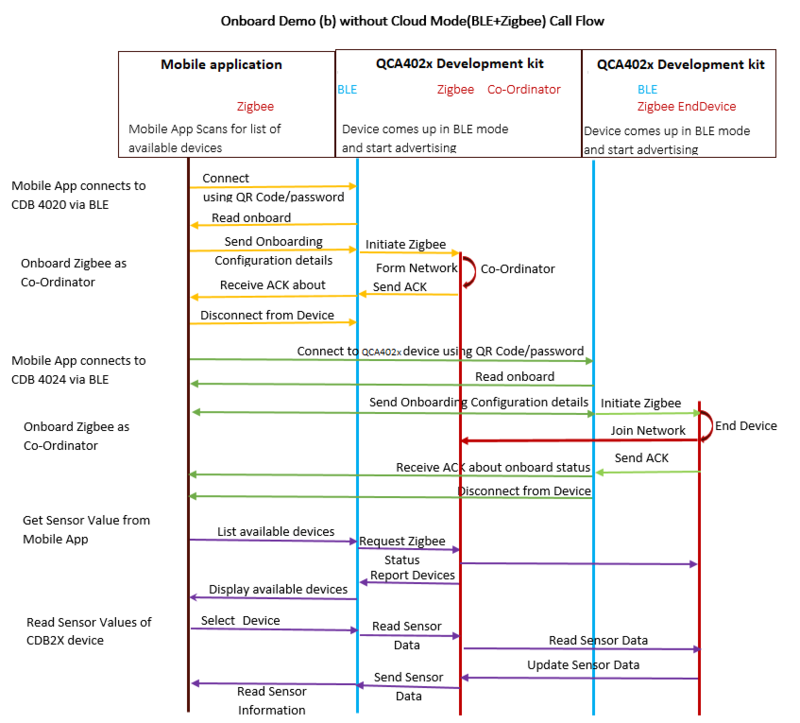 The flow of events and data exchange between the Mobile application and the QCA402x development board is as seen below. The mobile app uses BLE scan to connect to the development board with default password "123456". Once the development board receives the BLE passkey and proceeds onboarding from the mobile app, it validates the configuration and saves it to the filesystem. Next step is to onboard the Zigbee coordinator on QCA4020 development board. 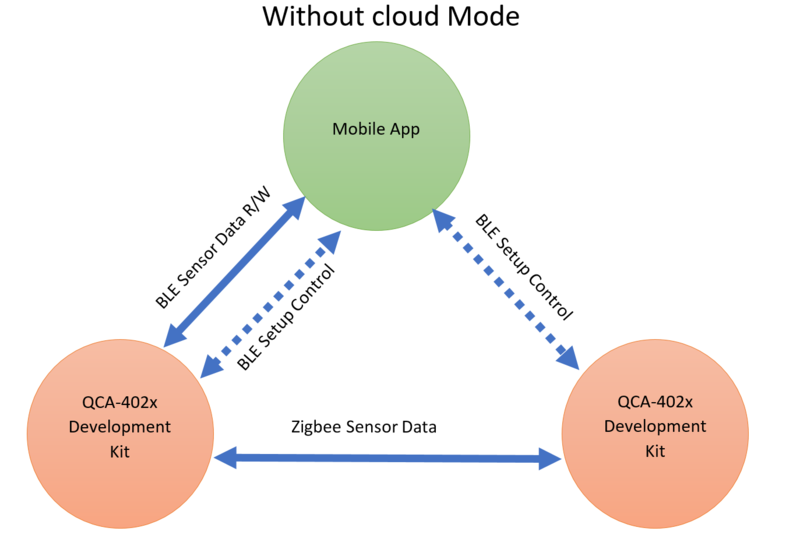 On successful BLE connection of mobile app and QCA4020 device, the mobile app reads the Zigbee service for onboard status through BLE connection. If the status is success and Zigbee mode is coordinator, the mobile app generates link key and sends the credentials packet to the QCA4020 device running as Zigbee coordinator. 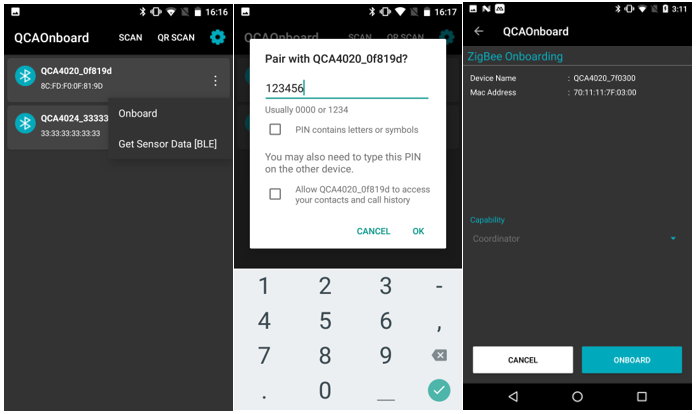 Once the QCA4020 device gets the operating mode and link key, the onboarding demo extracts the onboard details, validates the configuration, stores to the filesystem and sends the ACK to the mobile app. The QCA4020 device starts Zigbee service as a coordinator/router/end device based on the user-configured Zigbee operating mode. Once the mobile app receives the Zigbee onboard status notification it displays the onboard status screen and status. Onboard Zigbee end device on the second QCA402x development board via BLE connection. This QCA402x device runs as the Zigbee end device connecting to the Zigbee coordinator QCA4020 device. On the mobile app main screen, select and onboard the device using the default password "123456" via BLE connection. 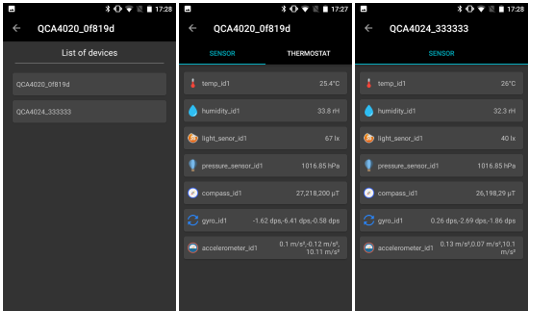 The mobile app checks for the QCA4020 onboard status over a BLE connection and displays the Zigbee connection status. You will need to select the relevant Coordinator device name which lets the end device join the zigbee network. If the QCA4020 end device is onboarded successfully, the mobile app displays successful onboarding device status; else it notifies with failure status and disconnects from the device. Once both devices are onboarded, the next step is to get the sensor data through Zigbee and BLE. You should be able to read sensor data and control sensors on the Zigbee end device through Zigbee coordinator. 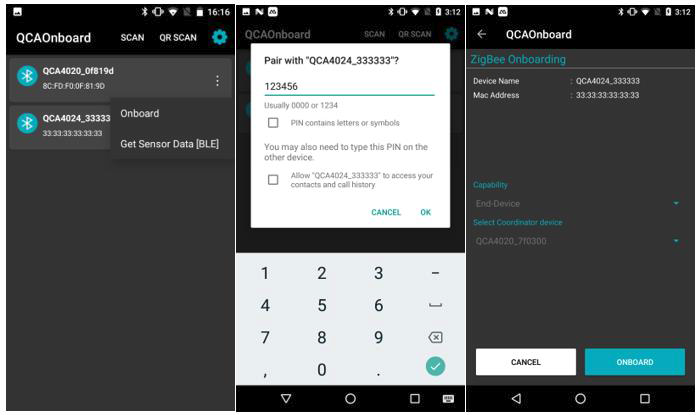 On the mobile app screen, connect to the coordinator device QCA4020_XXXXXX, and choose "Get Sensor List [Zigbee+BLE]" button via BLE using default password "123456". The mobile app screen displays the list of devices under the Zigbee network. You can select the Zigbee-connected QCA402x device, read the sensor values, and control the light intensity via BLE connection. Congratulations! You set up the development environment, imported, built and flashed a project on the QCA402x development board using the Eclipse IDE. On your smartphone, you can now read the sensor values that are sent from the development board. Staff Engineer, Qualcomm Technologies, Inc.